Chapter 1: Scanning Tunneling Microscopy for Self-Assembled Monolayers (P. Brodard, H. Fukumura). Chapter 2: Monolayer Properties Probed by Surface Forces Measurements (A. Dendinaite). Chapter 3: Surface Plasmon Optics for the Characterization of Biofunctional Architectures (Fang Yu et al.). Chapter 4: Probing Surfactant Adsorption at the Solid-Solutin Interface by Neutron Reflectometry (J. Penfold, R.K. Thomas). Chapter 5: Near-Field Scanning Optical Microscopy of Lipid Membranes (B.N. Flanders, R.C. Dunn). Chapter 6: Micro/Nano Lithography using Self-Assembled Monolayers (SAMs)(O. Takai, K. Hayashi). Chapter 7: Highly Fluorinated Lnagmuir, Langmuir-Blodgett and Gibbs Monolayers (M. Pierre Krafft). Chapter 8: Structure and Physicochemical Properties of Polyalkylsiloxane Monolayers Prepared onto the Solid Substrate (T. Koga, A. Takahara). Chapter 9: Hono- and Hybrid-Monolayers of Dendritic Polymers (Toyoko Imae et al.). Chapter 10: Infrared Reflection Absorption Spectroscopy of Monolayers at the Air-Water Interface (Jiayin Zheng, R.M. Leblanc). Chapter 11: Measurement of Complex Formation and Agfregation at the Liquid-Liquid interface (Hitoshi Watarai). Chapter 12: Monolayers on air/Solid Interfacwes – Vibrational Spectroscopy and Atomic Force Microscopy Studies (Yukihiro Ozaki et al.). 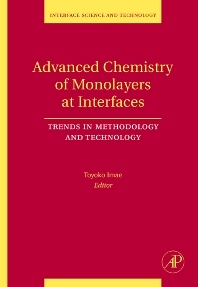 Advanced Chemistry of Monolayers at Interfaces describes the advanced chemistry of monolayers at interfaces. Focusing on the recent trends of methodology and technology, which are indispensable in monolayer science. They are applied to monolayers of surfactants, amphiphiles, polymers, dendrimers, enzymes, and proteins, which serve many uses. Introduces the methodologies of scanning probe microscopy, surface force instrumentation, surface spectroscopy, surface plasmon optics, reflectometry, and near-field scanning optical microscopy. Modern interface reaction method, lithographic technology and different types of monolayers like adsorption, Langmuir and Langmuir-Blodgett monolayers at air/liquid, liquid/liquid, liquid/solid and air/solid interfaces, are all covered. Professor Toyoko Imae was born in Japan. She joined the National Taiwan University of Science and Technology, Taiwan, as honorary chair professor in April 2009, immediately after retiring from Keio University, Japan. She is also a professor emeritus of Nagoya University, Japan, since 2006, a visiting professor of Tokyo University of Science, Japan, an Academic Icon professor of University of Malaya, Malaysia, since 2013 and a specially-Appointed Professor of Yamagata University, Japan, since 2015. Her major research areas are the fabrication, functionalization, and physicochemical investigation of nanomaterials, including polymers, carbon materials, inorganic materials, nanoparticles and their nanocomposites, in solutions and at interfaces. Her resent research target is a “Nanoarchitecture and Nanotechnology” towards energy, environmental and biomedical sciences. Prof. Imae has published more than 350 articles including peer-reviewed journal articles, reviews, and book chapters. She also edited three books of Advanced Chemistry of Monolayers at Interfaces: Trends in Methodology and Technology (2007), Neutrons in Soft Matter (2011) and Skin Bioscience: A Molecular Approach (2014). She has been conferred several awards as represented by “Promising Scientist Award of The Society of Japanese Women Scientists” (1999). She also contributes to the academic advancement as typified by a president of Asian Society for Colloid and Surface Science from 2013. Prof. Imae was an executive member of the Council for Science and Technology Policy in Japan and a member of the Science Council of Japan.